Work: Member of the New Jersey Assembly, 1761-1771; Served on the Committee of Safety, Committee of Correspondence, 1775; Judge of the Court of Common Pleas, Member of Provincial Assembly 1775; Elected to the Continental Congress, 1776. John Hart was a New Jersey farmer. His exact date of birth is not known. His father had moved from Connecticut to a farm near Hopewell New Jersey. He helped to build, and later inherited, that very successful farm and was a leading member of his community. His first public service was a justice of the peace. In 1761 he was elected the New Jersey Assembly, there annually reelected until the assembly was dissolved in 1771. In 1775 he was appointed to the local Committee of Safety, the Committee of Correspondence, and a judge to the Court of Common Pleas. 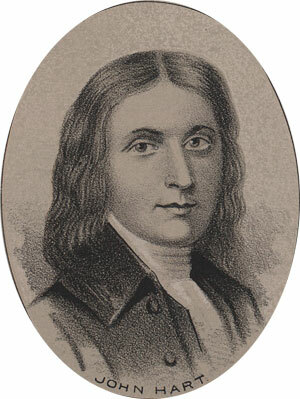 He was elected to the newly formed Provincial Congress of New Jersey in 1776, and sent as a delegate for New Jersey to the Continental Congress that year. Hart's property was looted in the course of the war. His Wife died on October 8, 1776. When the area was overrun by the British in November of that year, he was forced to hide for a time. He was engaged in public service throughout the war, twice reelected to the Congress and also serving the Commitee of Safety and as Speaker of the New Jersey assembly. On June 22nd 1778 he invited the American army to encamp on his farm. Washington had lunch with him, then had his famous Council of War at the nearby Hunt House. Twelve thousand men camped on his fields-during the growing season. After resting and preparing for battle the troops left on the 24th. On Tuesday, May 11th 1779, he died at the age of 66.